Much of the game data is modifiable through the F1 debug menu. Can be set through the devmenu by editing global.json. Letting you zoom the picture in or out. But could be considered cheating, or handicapping. Colors can easily be edited through the devmenu. 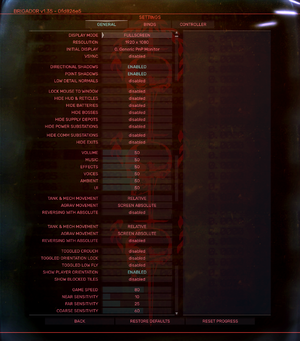 HUD elements residing in global.json. Added in the patch 1.1. Universal Control Remapper can be used to bind any device into a virtual xbox controller. L/R mouse buttons can get interrupted by multiple device inputs, interrupting full-auto fire. But mouse movement is unhindered. Open profile.json in a text editor. Add "leftStickDeadzone" : 0.25, "rightStickDeadzone" : 0.25, after the first curly bracket. GOG.com provides a 64-bit build for Linux. ↑ Steam Community Discussions - Having Controller Deadzone Issues? This page was last edited on 29 March 2019, at 02:41.